After years of "close, but no banana" attempts to out-inline-four the Japanese with their 600cc TT600 and Daytona, Triumph finally hit one out of the park with their slim, agile, and characterful Daytona 675, a bike capable of holding its own against the world's best, while offering a unique blend of flexible power, torque, and a soundtrack to differentiate it from the typical inline four and v-twin sportbikes. This Triumph Daytona 1200SE represents the path not taken: with no analogue in their current lineup, Triumph's four-cylinder Daytona was ultimately a dead-end for the company, as the smaller three-cylinder proved more popular and led the way forward for the company. But if you're in search of something cool, classy, affordable, and fast, this one might just tick the boxes for you. 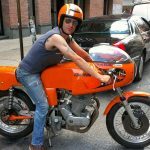 When Triumph was reborn in the 1990s, modular design allowed them great flexibility to refine their offerings and minimize the risks associated with new or niche models. Individual bikes were slightly compromised by frames and engines designed with versatility and not maximum performance in mind, but this kept the company light on its feet and and able to quickly respond to industry trends. 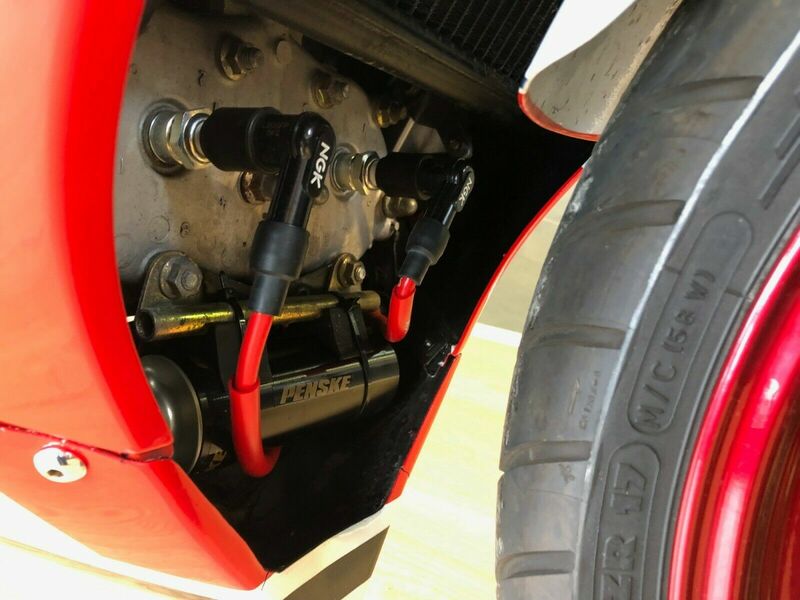 The Daytona 1200 slotted their biggest, most powerful engine into the spine frame, added the best suspension in their arsenal and fitted some very effective brakes. 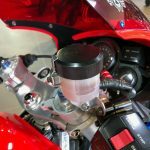 It was Triumph's big stick of their lineup and, even though it was discontinued after just a few years, that doesn't mean the four-cylinder Daytona 1200 isn't a great motorcycle. 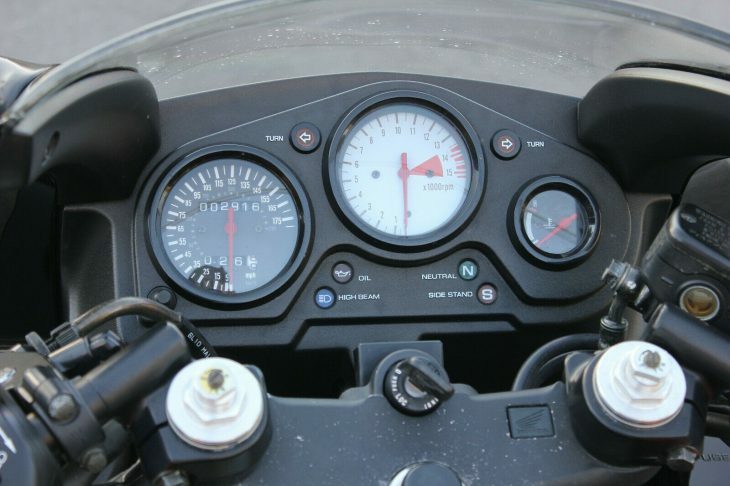 When new, it was considered a bit of an also-ran, since it was compared directly to Japanese rivals like the Suzuki GSX-R1100 and Kawasaki ZX-11 in that all-important top-speed metric while costing a good bit more. With 147hp from the 1180cc engine to haul 550lbs of wet weight around, power-to-weight compares favorably with the last generation of Suzuki's GSX-R1100, while offering an extra cog to make even better use of the flexible engine. 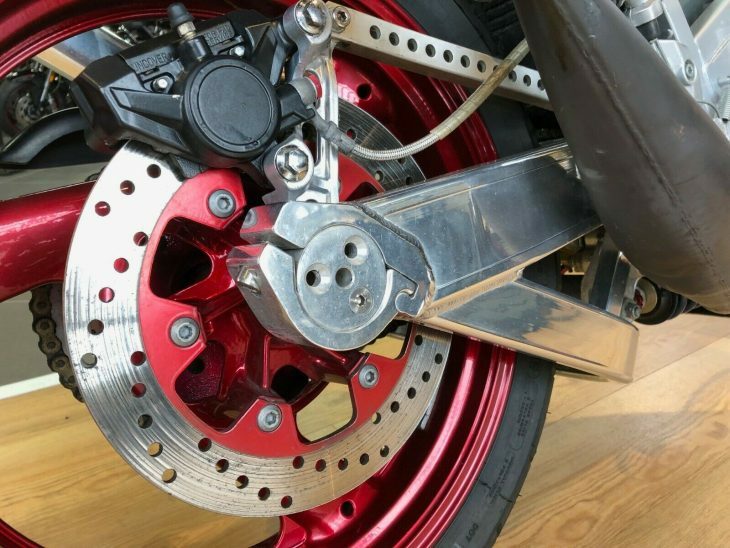 That may seem unimpressive by today's ludicrous power levels, but the 85lb-ft of torque is paired with real-world gearing that emphasized performance street riders could actually use, instead of hypothetical top speeds they couldn't. 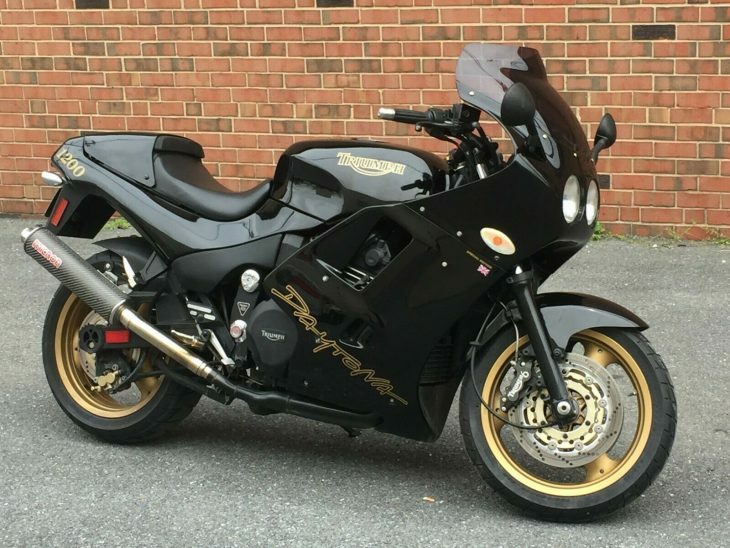 With stock gearing, a 1200 Daytona could easily embarrass a ZX-11 from 40-100mph, before running out of puff at a mere 160mph. 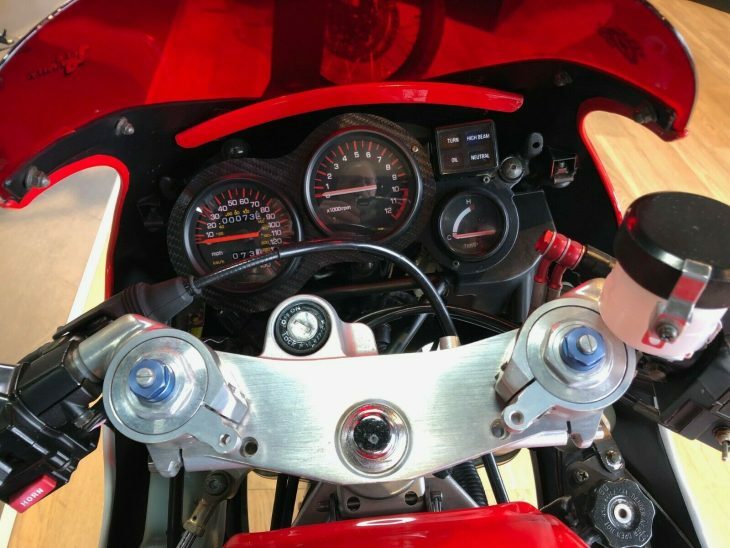 And like the ZX-11 and the later GSX-R1100, the Daytona wasn't a sport-touring bike, it was a big GT, a sportbike with comfortable ergonomics suited to mature riders who wanted to occasionally do very immature things on their motorcycles. 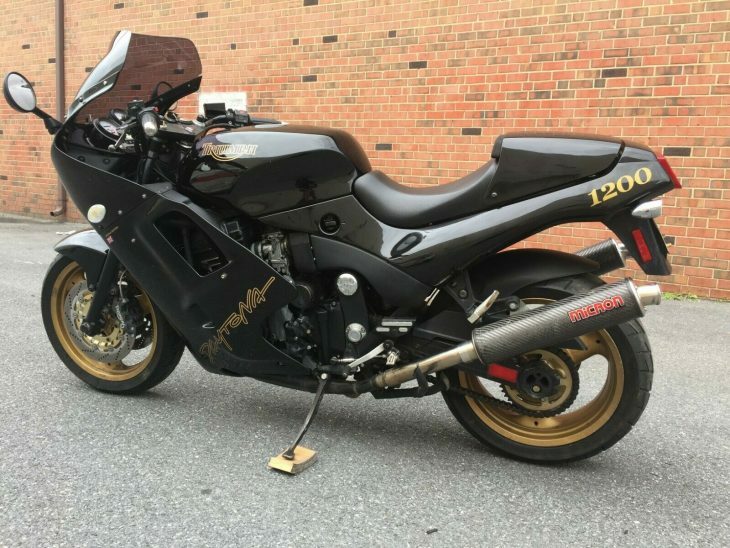 A GSX-R with wild graphics and neon colors would blast to triple-digit speeds, strafe canyons, but had very boy-racer pretensions, for better or worse. But if you'd aged out of that, but still wanted to scare the bejesus out of yourself without needing to pretend you were hitting LeMans the following weekend, the Daytona was available in elegant black, classic British Racing Green, or a rich yellow. 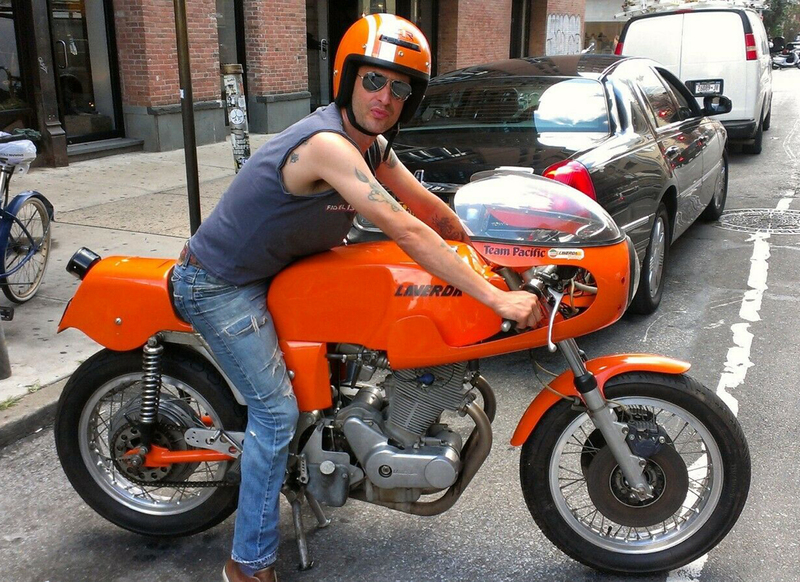 The styling was simple and unadorned by crass graphics, and the bike exudes class from nose to tail. Helping a family friend clear out an estate. 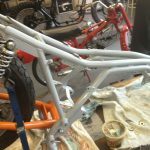 Two Owner bike, Was adult owned its whole life, most recently by an avid motorcycle enthusiast in his 60's for the last 15 years. Clean and Clear title ready to go and two sets of keys. 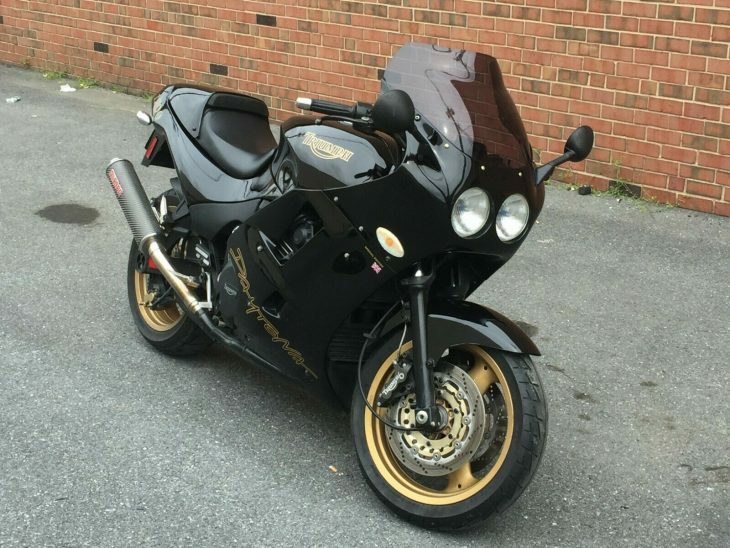 Limited edition 1999 Triumph Daytona 1200 in very nice condition. This is a rare bike they do not come up for sale often. 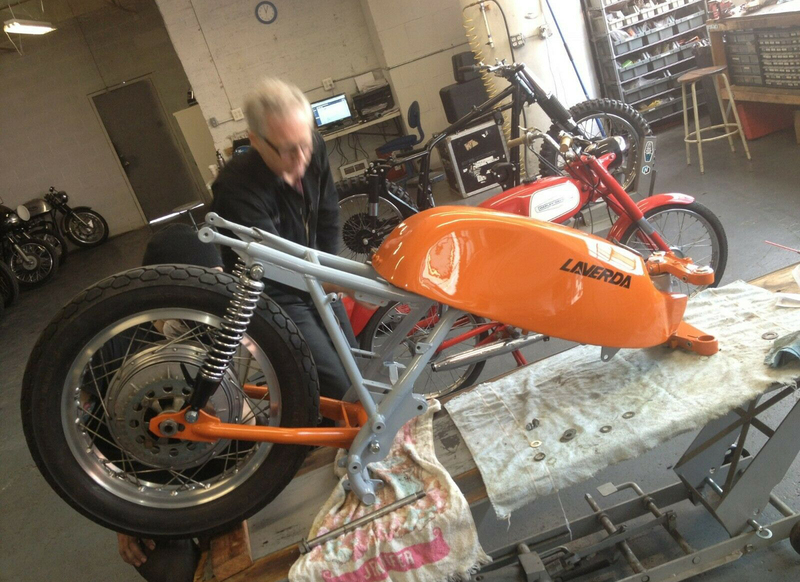 limited production Only 250 made, this is bike #175. She has been sitting in storage for the last 2-3 years or so, fuel was drained before storage. Pulled it out, new battery, gave it a wash, put fresh gas in, fresh oil change, and she fired right up and sounds amazing. Tires have good tread left, the bike brakes and handles amazing, its very fast! 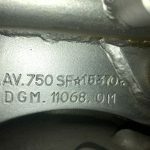 This bike has been very well taken care of and well maintained by owners. No leaks of any kind. Don't let this rare opportunity pass you by!! 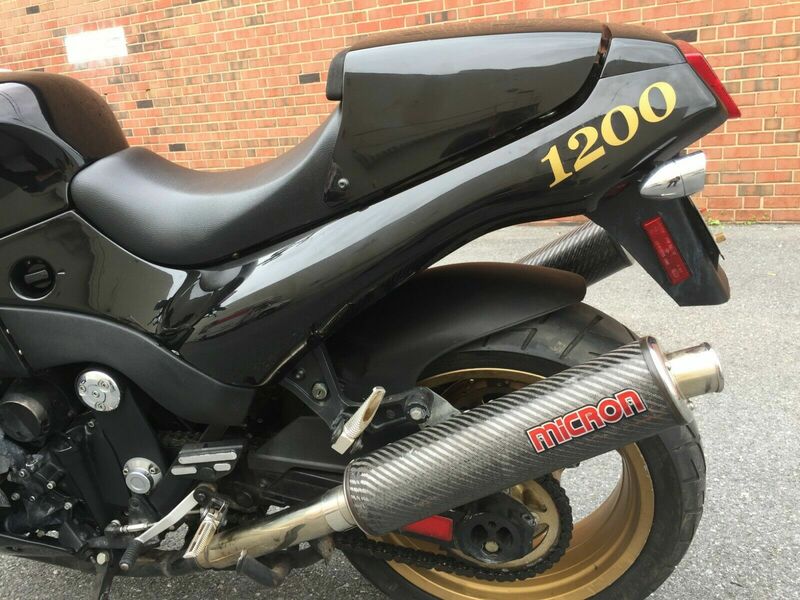 With a Buy It Now price of just $5,500 this is a ton of bike for the money, and it looks clean and relatively unmolested, with just 15,000 miles on the odometer and a set of Micron carbon cans to liberate a bit more growl, as you can hear in the included video. It's unfortunate the seller doesn't know more about the history, but is pretty thorough in presenting what is there. 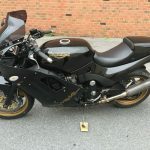 It's not quite perfect, with some scratches, flush front signals, and the frankly awful rear turn signals, but looks complete and all Triumphs of the era still represent a seriously fast chunk of classic sportbike for a pretty minimal outlay of cash. 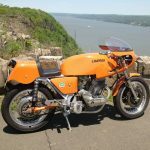 Largely forgotten now, especially by modern sportbike enthusiasts, Laverda was once a serious player in the Italian sportbike scene of the 1970s. In terms of reputation, anyway, if not in actual production numbers. 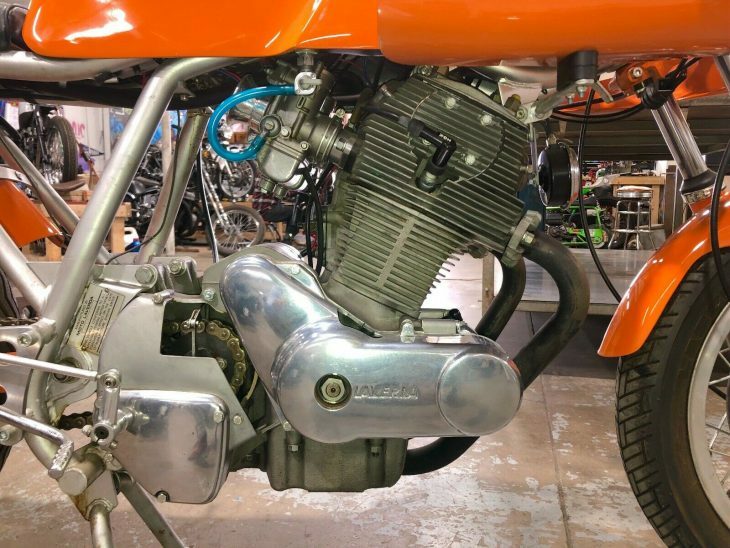 Their big-bore parallel-twin was supposedly heavily "inspired" by Honda's parallel twin design of the period, and Laverda's grown-up engine was heavily overbuilt and basically all-around heavy. It wasn't nimble, but it was durable and stable, the perfect bike to use as the basis for a production-based endurance racer, and the SFC or "Super Freni Competizione" was the result. 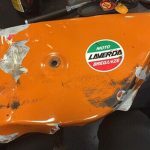 Laverda's aim was to use the very best parts available on their road and race bikes, and included Italian suspension components, Japanese electricals, and German ignition components. 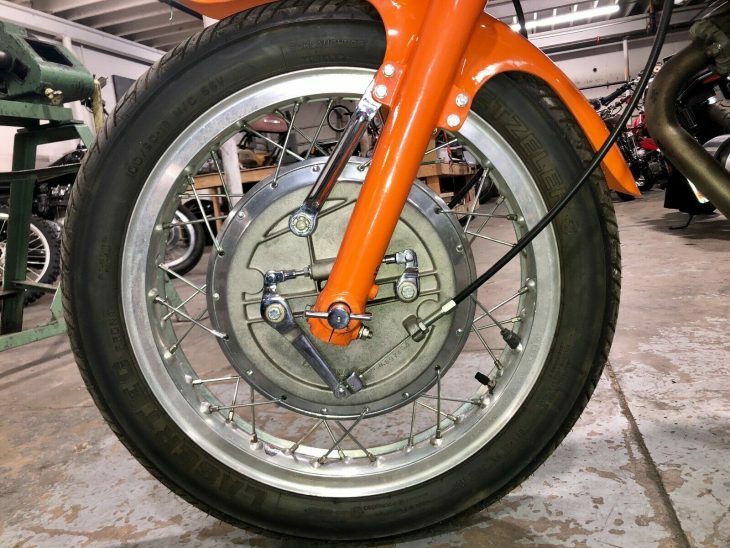 The early bikes used a huge, magnesium Ceriani four leading-shoe front brake, with later machines switching to an improved twin-disc setup. In both cases, stopping power was superlative for the era. Engines were heavily massaged, and made between 71 and 81hp, depending on the year. 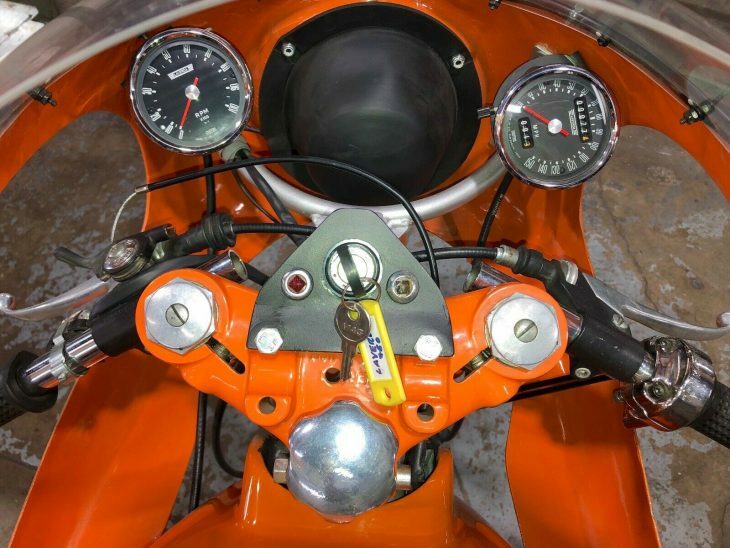 A significant overhaul for the 1974 model year made changes to the frame to make it lower and lighter, and the suspension was improved. With the very rare SFC out of reach for most collectors, a replica obviously makes practical sense, since it was basically a hot-rod 750 SF. It'd probably be relatively easy to take an otherwise stock SF1 and just slap on a fairing and tail-section, but the builder of this bike appears to have gone the extra mile. 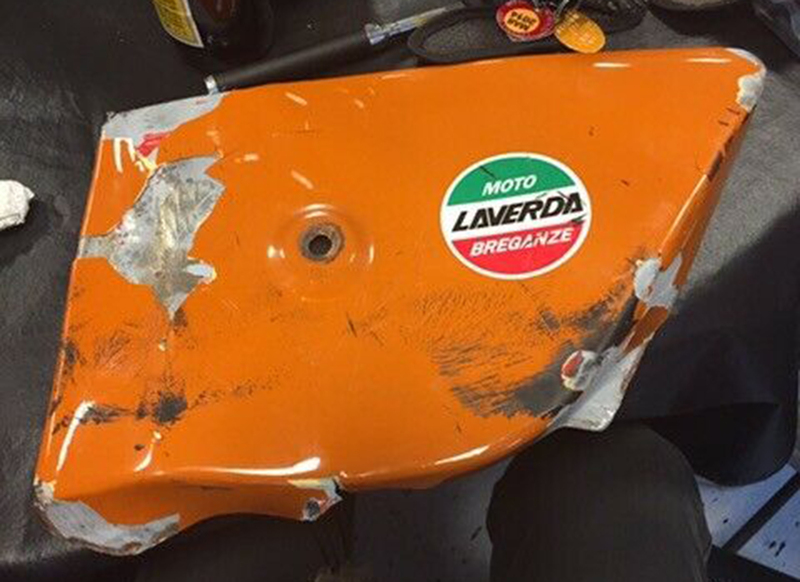 I'm a Laverda fan, but not enough of an anorak to be able to point out the minor differences that would mark this out as a fake. It probably doesn't help that the fewer than 600 or so SFCs that were built varied a bit in terms of specification, and sometimes incorporated different components in what seems to have been the "whatever we've got on the shelf" kind of way typical of Italian manufacturers of the period. 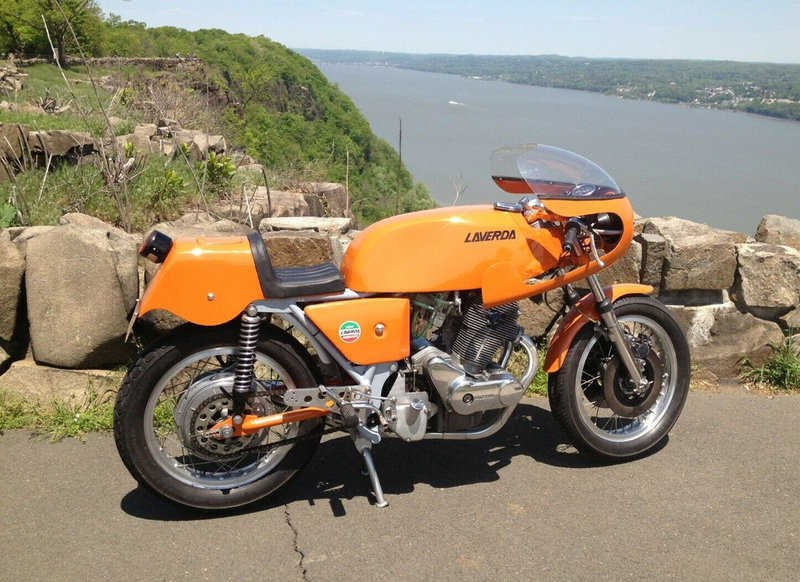 This is a beautiful example of a Laverda Type SFC, one of the ultimate vintage sport bikes that will get attention everywhere it goes. Display it, ride it, you won't be disappointed. Of course there is no warranty, implied or guaranteed, it is a vintage bike even though it certainly doesn't look its age... 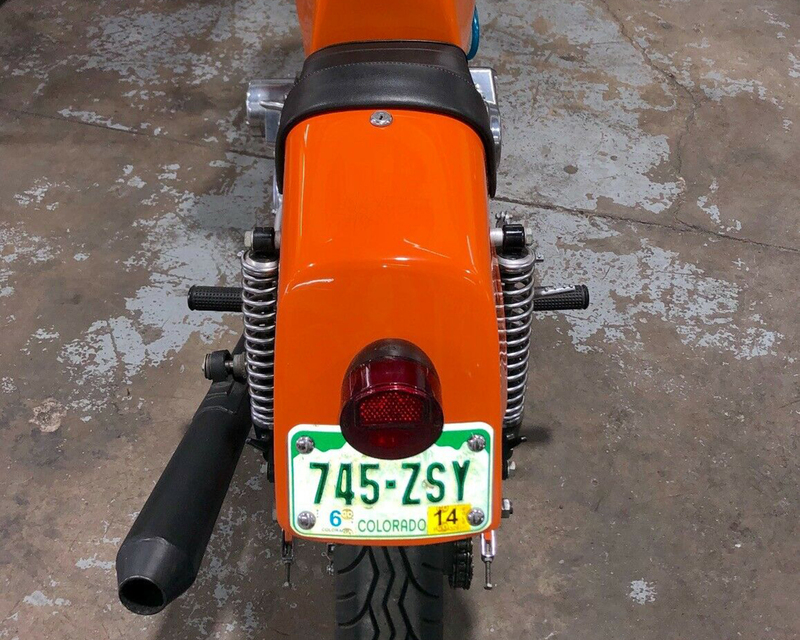 Please look at the pictures closely, the bike is located in the Denver area and we will assist with shipping as buyer arranges. Clear title, $1000 deposit within 24 hours of winning bid, balance within seven (7) calendar days via wire transfer. 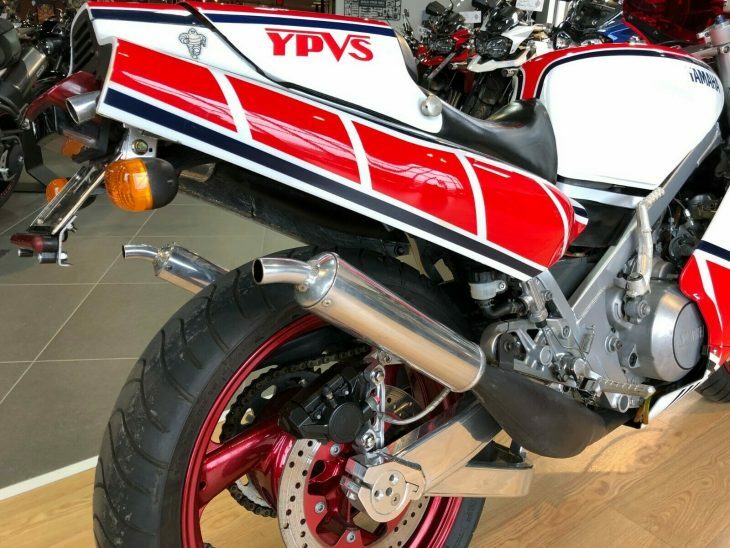 It may not be the real thing, but looks very clean in the pictures, with the desirable drum front brake that gave the bike its name. 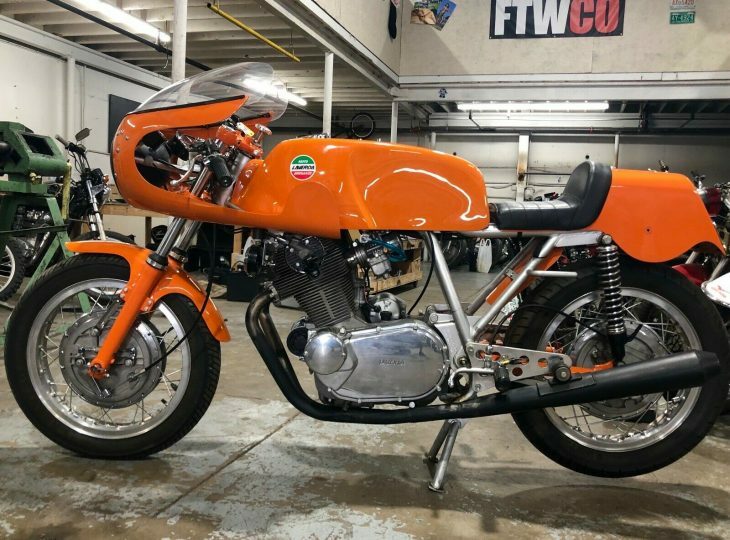 Individual SFCs varied from bike to bike in terms of the details, and I doubt anyone but a Laverda expert would realize it was a replica at a glance, although it's almost too nice to be the genuine article. 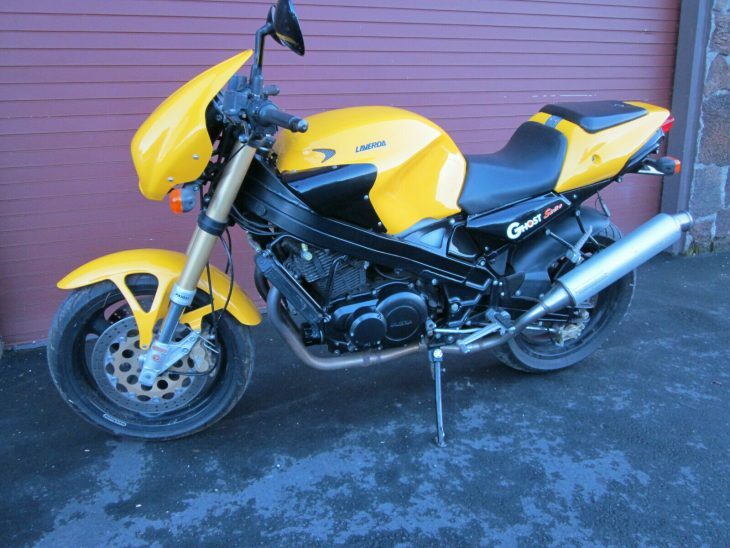 There are just hours left on the auction, and there's been little interest in the bike so far. Bidding is up to just $10,300, which is cheaper than a nice, stock SF1 these days Obviously, this isn't going to command the nearly six-figure prices of the best SFCs, but would be a great way to live out your Walter Mitty-style racing fantasies if you can't cough up that kind of coin, but want an authentic SFC experience. 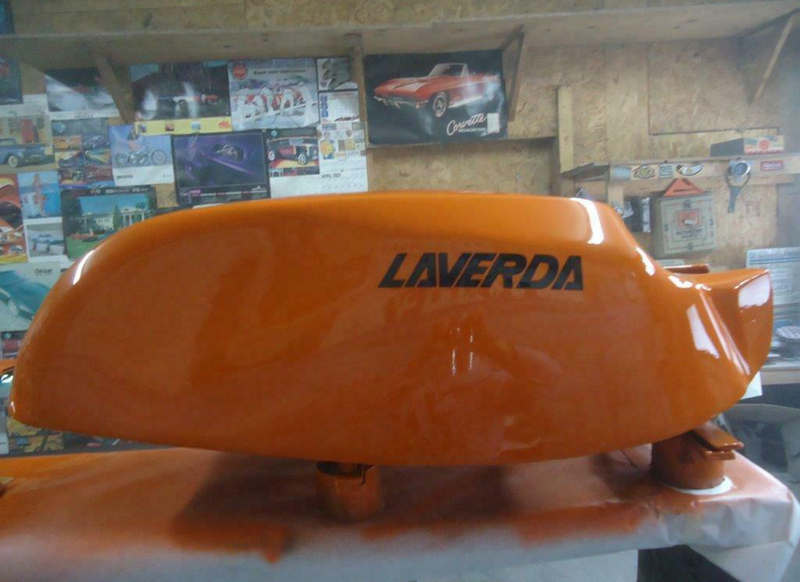 I'm a huge Laverda fan, so it's disappointing their attempted resurrection in the 1990s didn't work out. 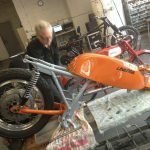 It wasn't that bikes like this Ghost Strike weren't any good: the beam frames were designed by the famed Nico Bakker and handling was generally considered excellent, even superior to Ducatis competing in the same segments. 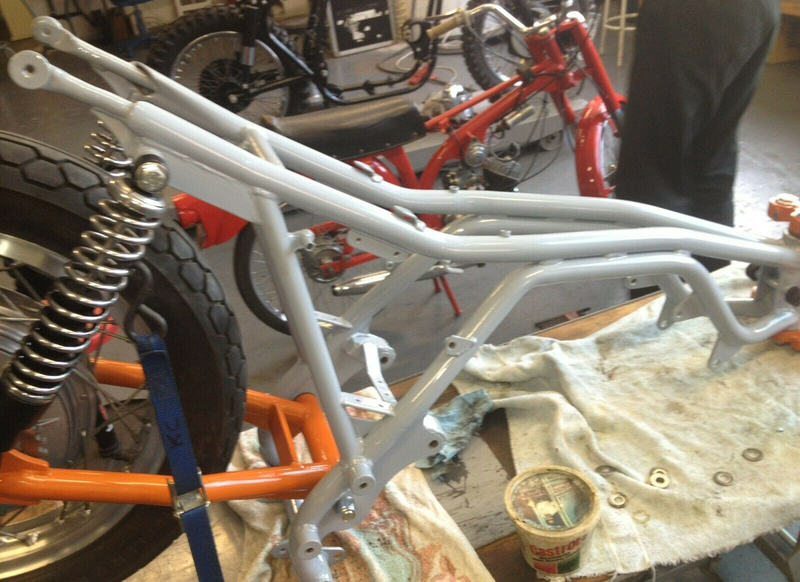 The standard Ghost used a trellis frame similar to the ones that underpinned the Ducati Monster, although the Strike featured a beam frame using identical geometry that was shared with the fully-faired 750S and Formula models. Suspension was fully-adjustable, with a set of beefy Paioli forks at the front. 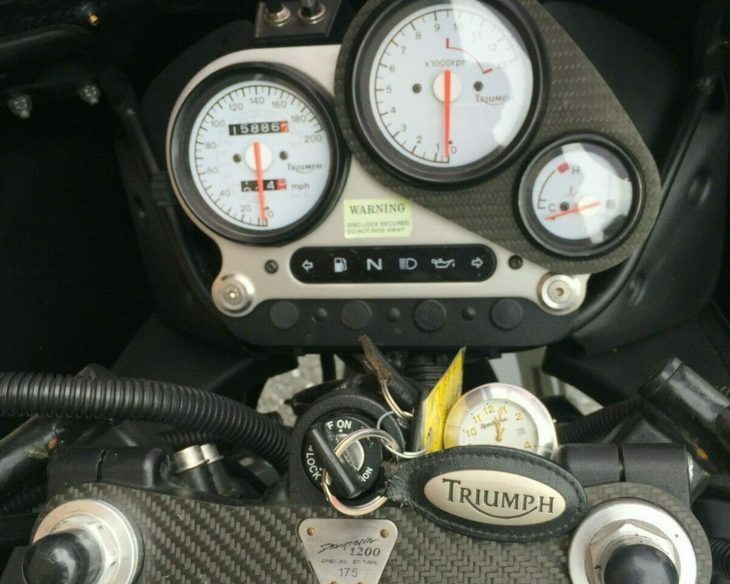 There was some very forward-thinking in the layout as well, as you'll notice that the "gas tank" is actually an airbox, with the actual filler-cap hiding under the lockable pillion pad. 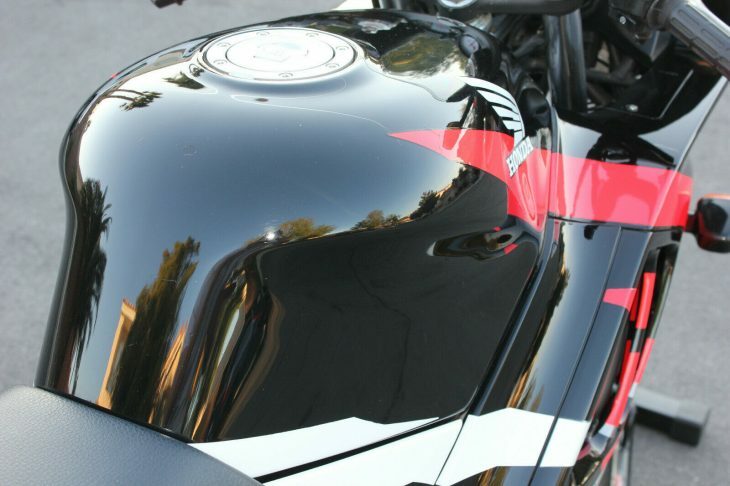 The fuel cell was centrally-located for better balance, a feature seen on many modern motorcycles. The biggest weak point of the design was the engine. Based on the positively ancient 500 that had been around since the Alpino of the late 1970s, it was fairly sophisticated when it was introduced, with dual overhead cams, a balance shaft to smooth the parallel twin's vibration, and a six-speed gearbox. 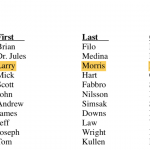 Of course, that wasn't much to brag about by the time the mid-1990s rolled around. 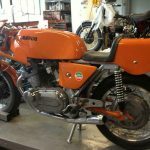 For the Ghost and Sport, Laverda punched the twin out to 650 and then 668cc, then later added water-cooling for the fully-faired 750S and Formula models. 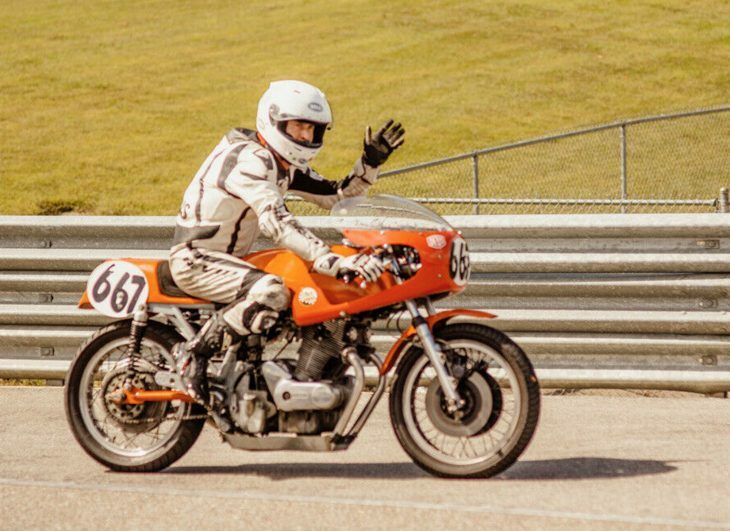 It made decent-enough power and liked to rev, but was considered a bit agricultural, and not as strong as options from Ducati, as the 904cc v-twin in the Monster had much more torque and the four-valve Ducatis were just more refined. 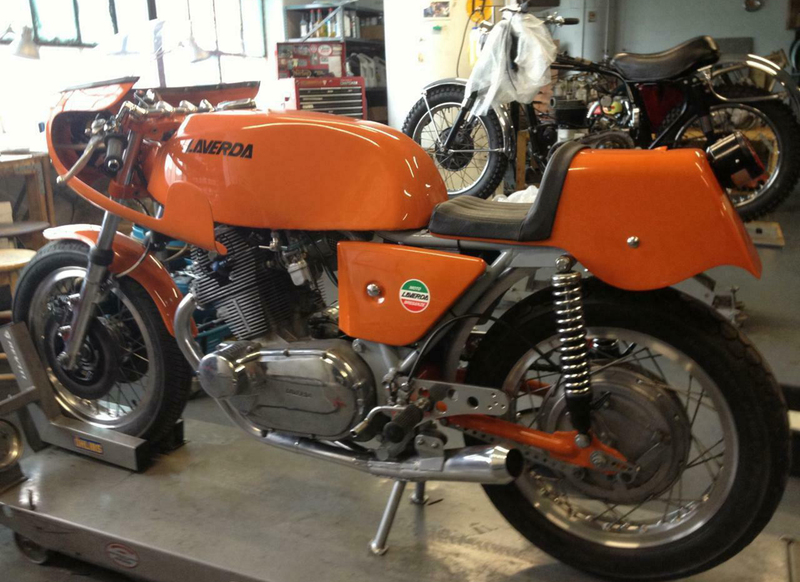 It's doubtful the Laverda Ghost will ever be worth very much, at least not in the near future. It's appeal is primarily one of novelty, since it's not an especially noteworthy motorcycle and the brand has ceased production. But the low market values, quirky design, and good performance make it very appealing for budget-minded enthusiasts. Power is modest, but the handling is excellent, and you certainly won't see another at your local bike hangout. 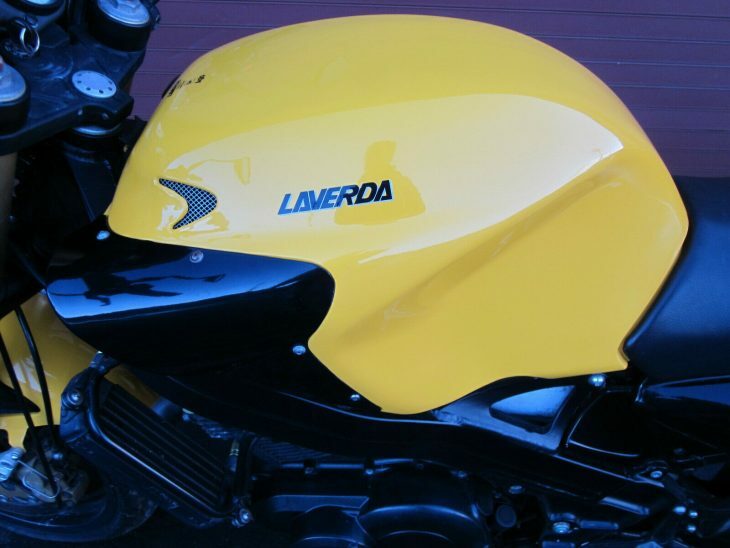 1998 Laverda Ghost Strike. Very stock and clean "no stories" survivor bike with low 11,000 km (~7000 miles). This has a clean California title and it is currently running fabulously. The previous adult owner used it sparingly. Tires, battery and fluids are all good. 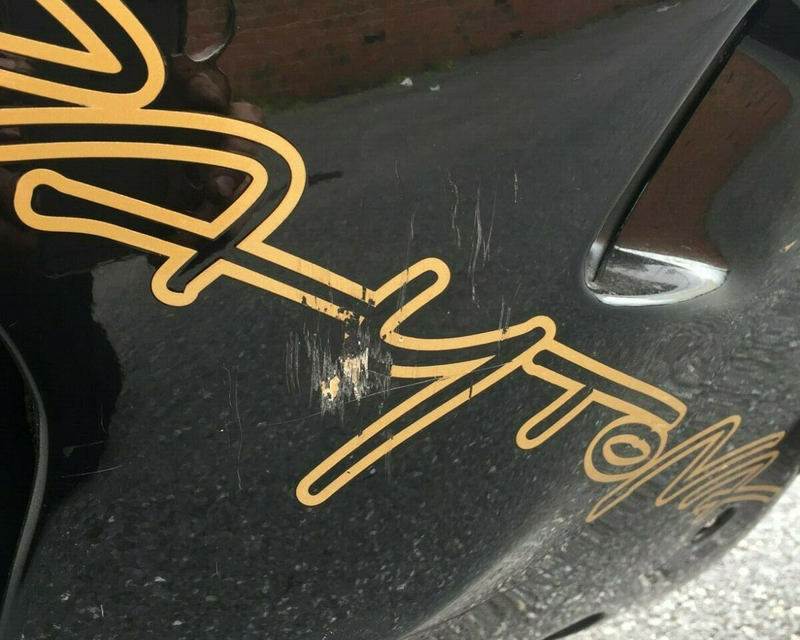 There is no crash damage. The Ghost is the probably most approachable of the Zane Laverdas- its simplified air cooled engine is more dependable than the water cooled Formula 750s. It has a modern twin spar frame and top shelf suspension, brakes and other components. It's easy to ride, service and enjoy. These bikes will only increase in value over time. 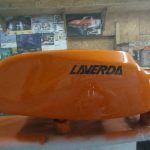 I also have a small of collection of spares for Zane Laverdas as we have parted a few of them out... including one other another clean Ghost Strike. Message us for details. You can pickup in San Francisco Bay area. I can also transport this to the Los Angeles area inexpensively. I can also ship this with Forward Air in teh US for $780 to most major airports with a Forward Air Terminal. Message me for details. This example looks very complete and the mileage is low, although it's hard to really tell from the washed-out pictures just how nice it is. 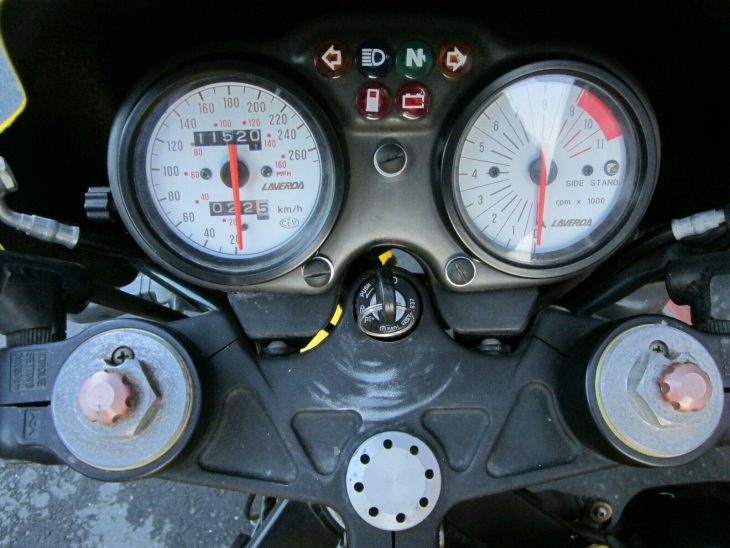 It's important that the bike appears to be very complete, and the spares he mentions are especially nice since, since finding parts for a relatively low-volume Italian sportbike that had little-to-no presence here in the US could prove problematic. There appears to be some oxidation on the engine and some wear on the top triple-clamp, but otherwise looks pretty nice. 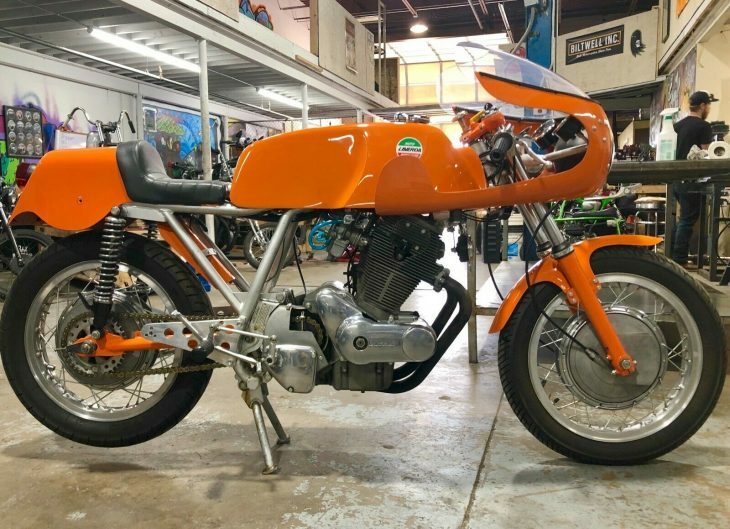 If the Reserve is anywhere near the $3,399.99 starting bid, this could be a fun little choice for a collector with a love for weird Italian exotica, or someone looking for a characterful bike on a limited budget. 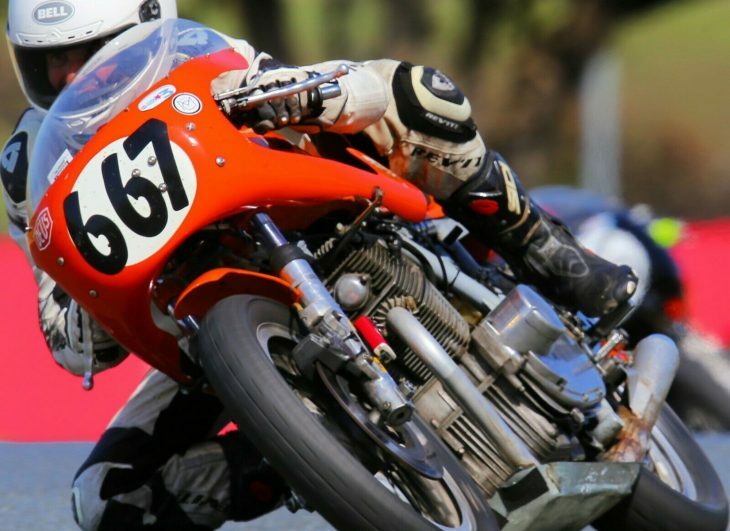 Compared to a modern superbike, the fire-breathing performance of vintage two-stroke race replicas maybe isn't quite as wild as their reputation would suggest. At the time, they were light and very powerful, but weren't exactly at Grand Prix extremes of either even then. 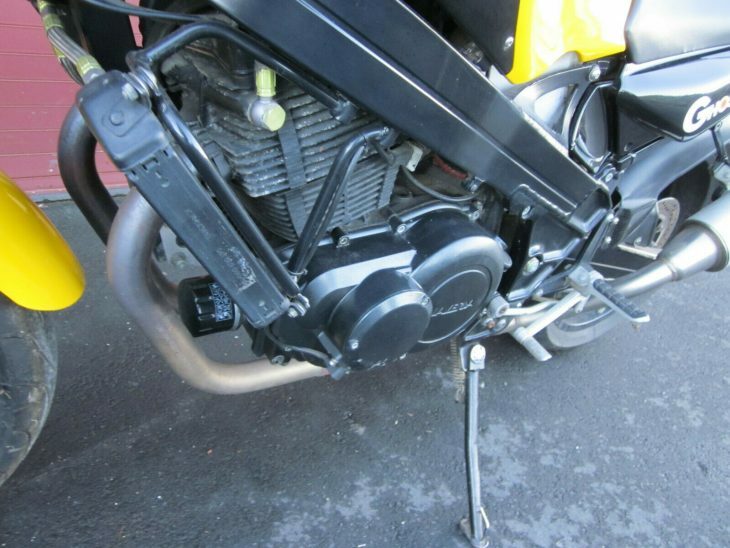 Modern machines have levels of rigidity, suspension response, and electronic assistance an old smoker like this Yamaha RZ500 could only dream of, back in the hazy 1980s. But an RZ500 still has the goods to be hustled along a canyon road, and this example has had a couple of updates to the running gear to help it hang with newer bikes. 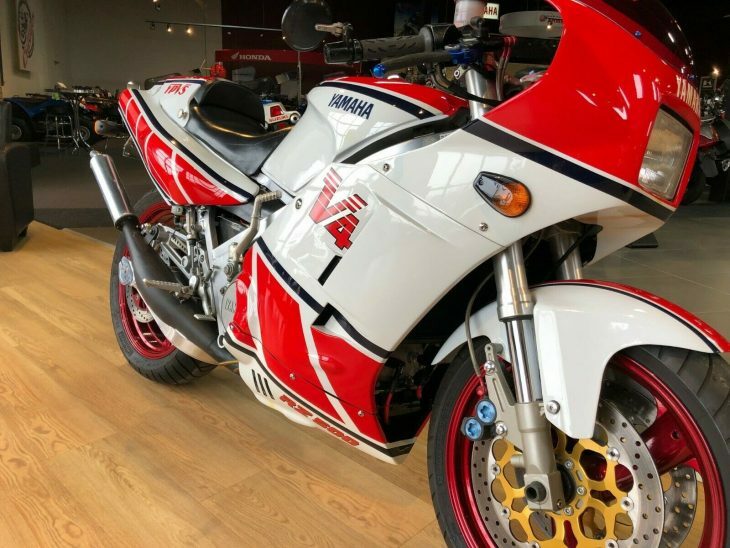 Also known as the RD500LC in Europe and the RZV500R in Japan, the RZ500 was powered by a a liquid-cooled 50° two-stroke V4 that featured twin cranks, a pair of YPVS power valves, a balance shaft to smooth things out, and magnesium components to reduce weight. 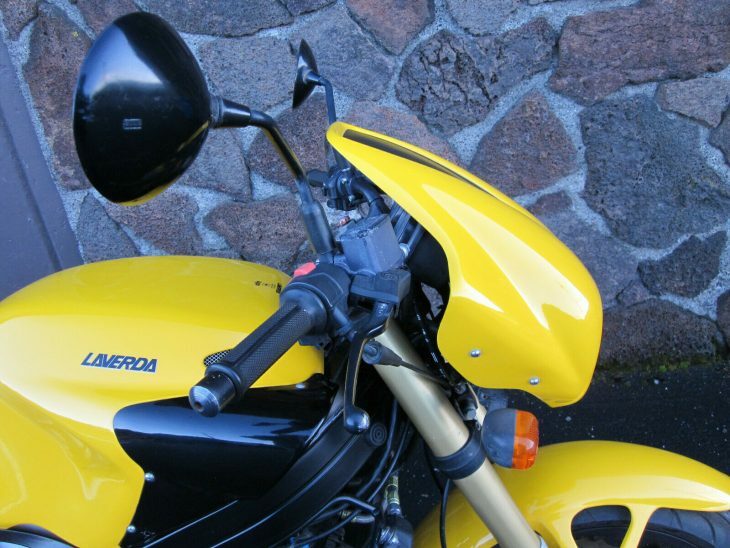 Lubrication for the two-stroke was handled by Yamaha’s Autolube oil-injection and the transmission had six speeds. 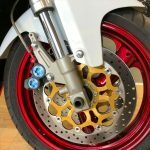 At the front was a 16" wheel and a set of anti-dive forks matched to an underslung rear shock and an 18" hoop out back, limiting a modern rider's access to good performance rubber. 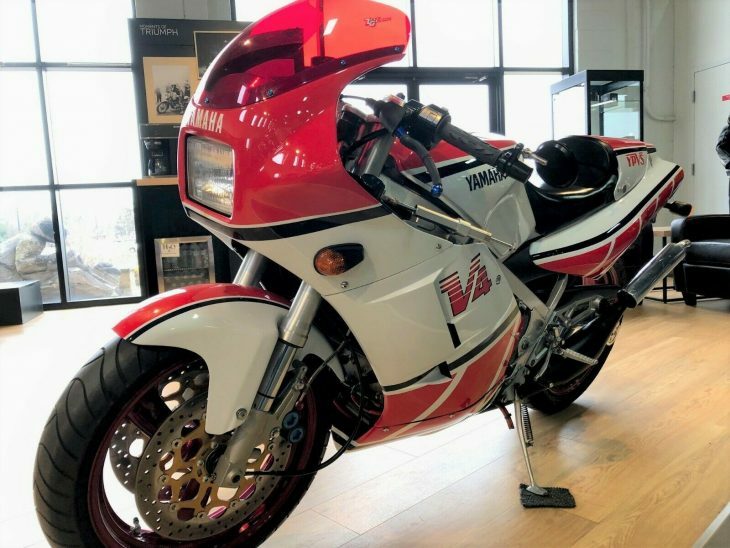 The Yamaha RZ500 made a claimed 88hp and weighed in at 436lbs wet, while a 1986 Suzuki GSX-R750 of the same period made a claimed 106hp and weighed 465lbs wet, so performance was pretty similar on paper. However, the character of the two bikes couldn't be more different. 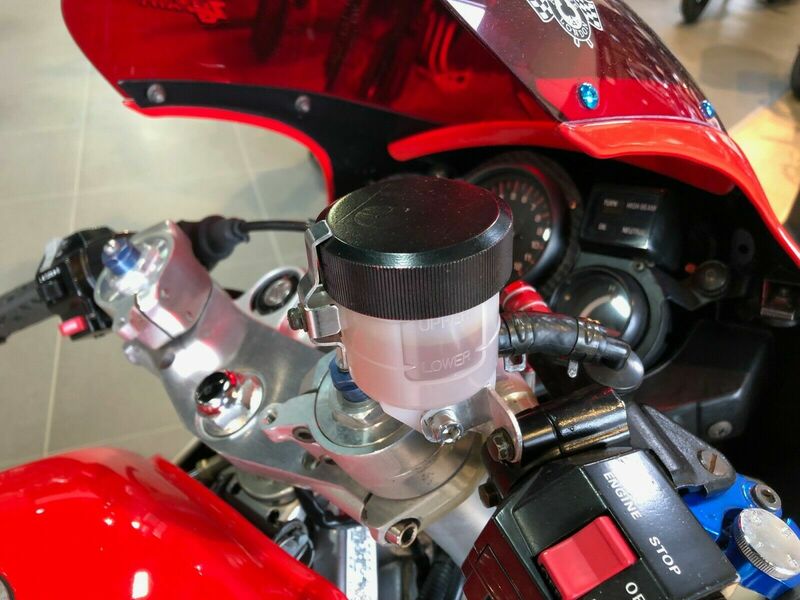 With heavy two-stroke smoke dripping out of the four exhaust tips and the crackle and zing of the engine, you have to work the RZ500 much harder, in spite of a pair of power valves designed to improve midrange response. Interestingly, the Japanese market bikes received an aluminum frame to offset the reduction in power required by government restrictions. 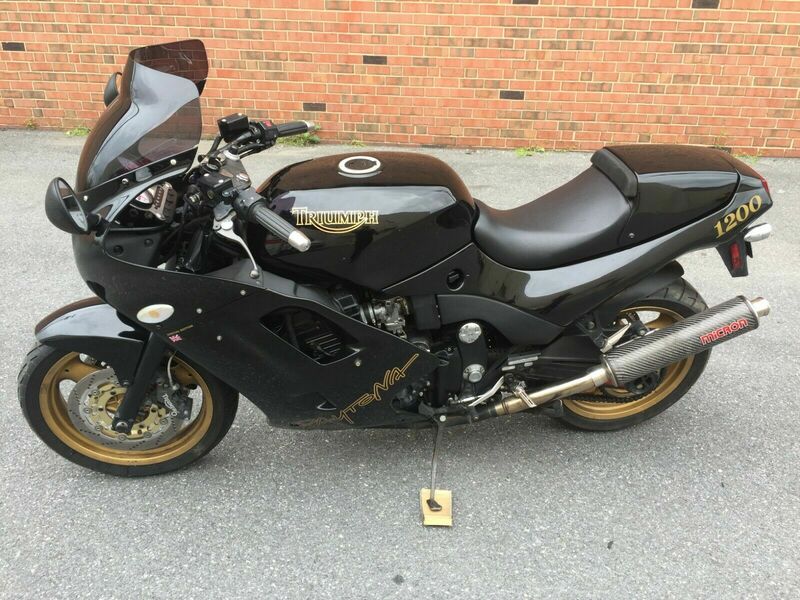 I always wonder why, since this was a premium sportbike to begin with, they didn't just fit the aluminum frames to all of them. 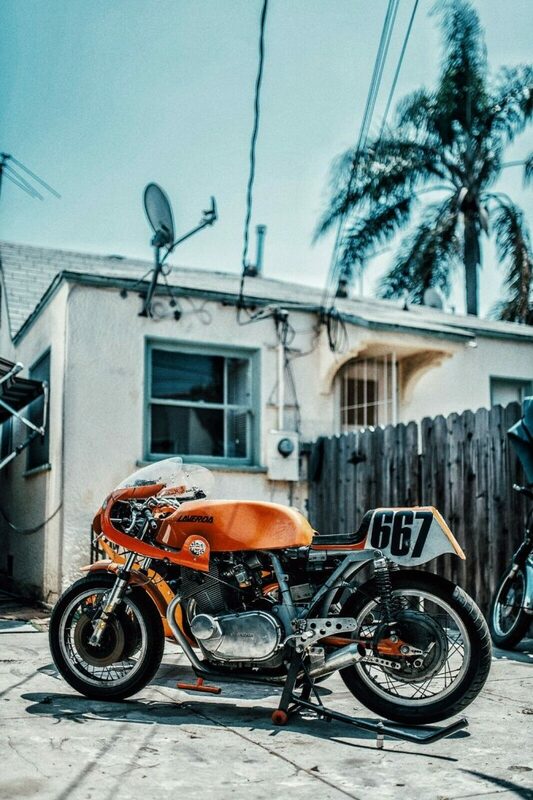 Certainly, if you wanted to build your dream RZ500 and throw originality to the wind, that's what you'd probably do. This particular bike follows the path of "thoughtful evolution" and includes some components from later machines that should help the bike's cornering prowess. 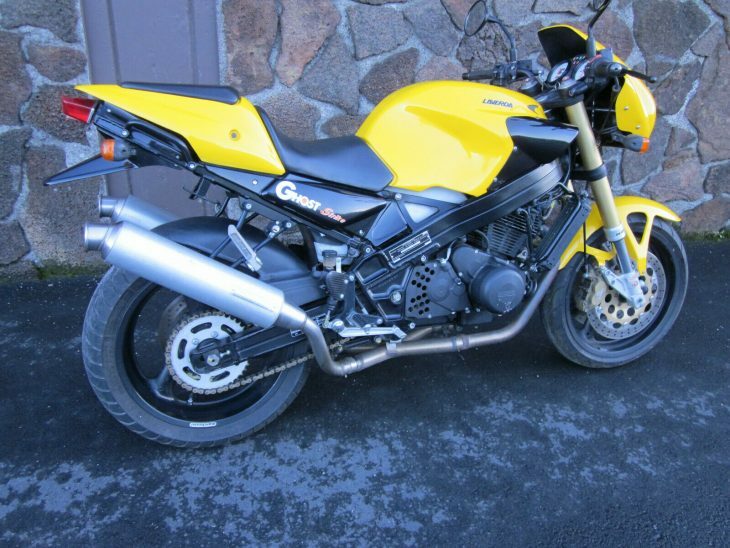 It's maybe not a purist's museum piece, with the later YZF750 front end and 17" wheels. 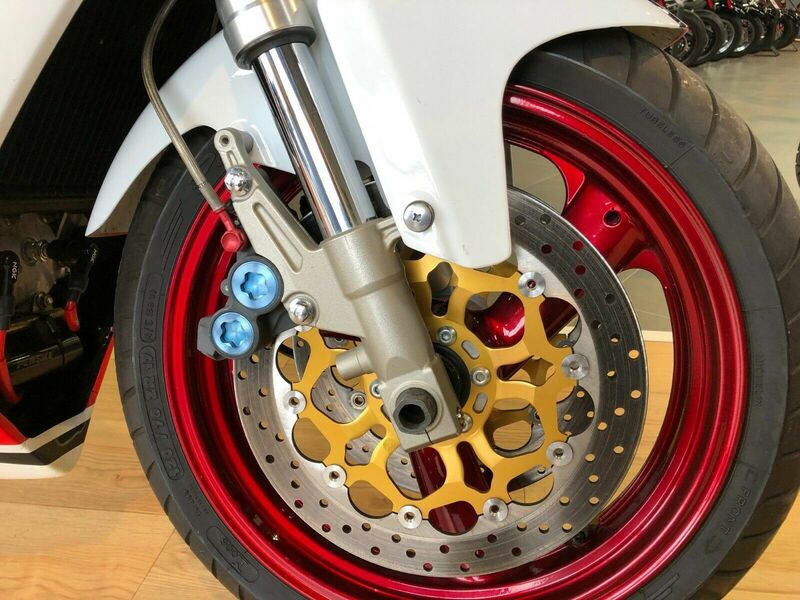 But, while the RZ500 was commendably light and agile by mid-80s standards, an update to the fork and brakes should help bring the bike closer to modern feel, while the ZX6 wheels will make tire choice much simpler, and give the new owner access to modern levels of grip. 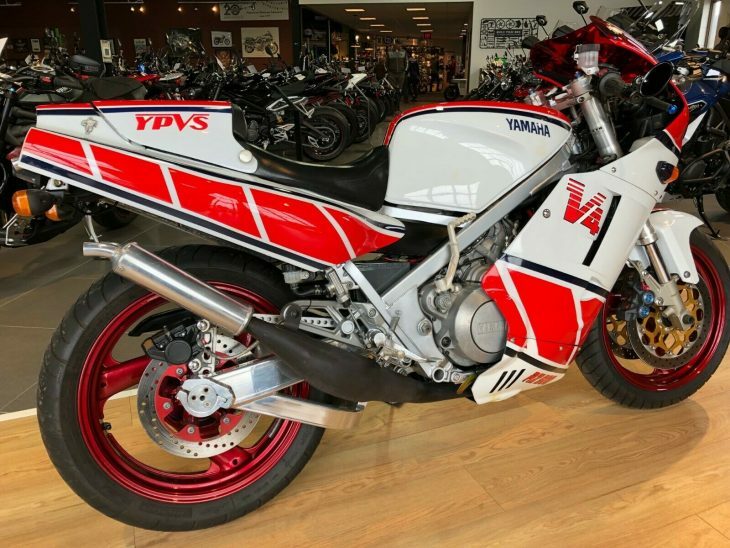 We are a Yamaha dealer selling this bike for a 2 stroke collector's estate. 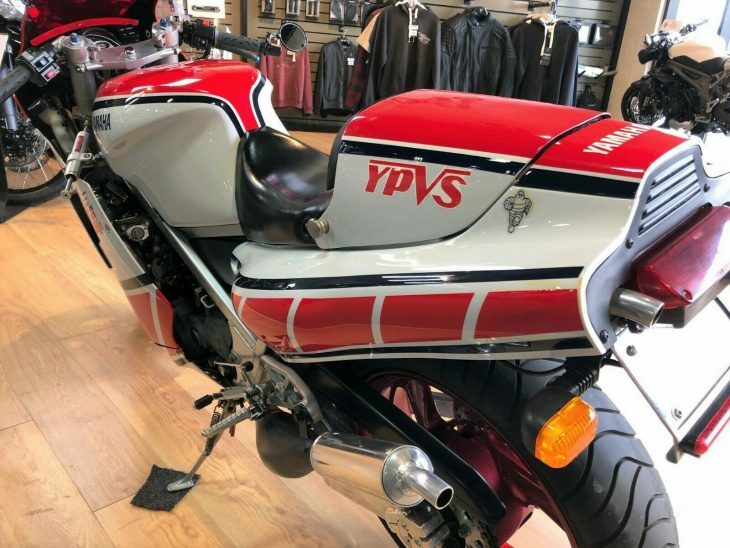 This is a great example of a 1986 Yamaha RZ500. It has a clear Pennsylvania title (has been here since at least 2006) but was originally sold in Canada. 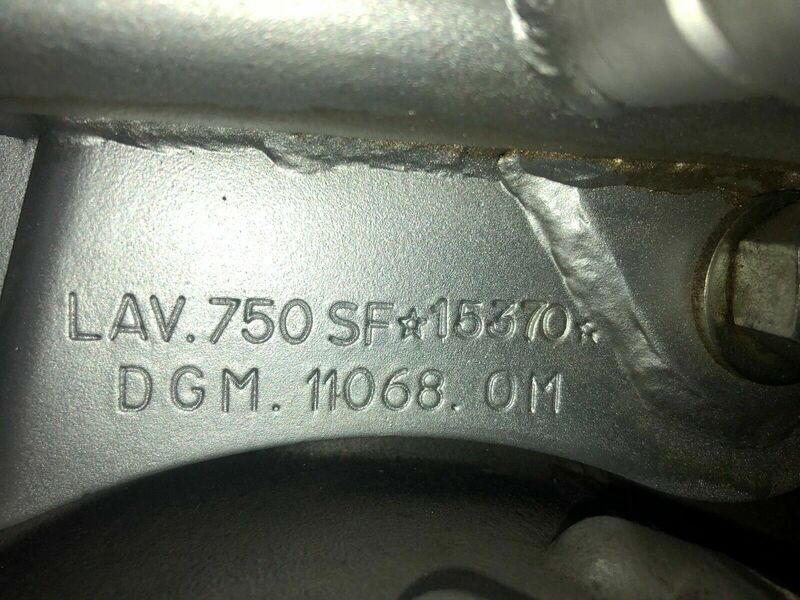 VIN is JYA52X007GA007150. The odometer reads 73 miles but since the KM speedo was replaced the actual odometer is aprox. 7500 km with about 1000 km since rebuild. 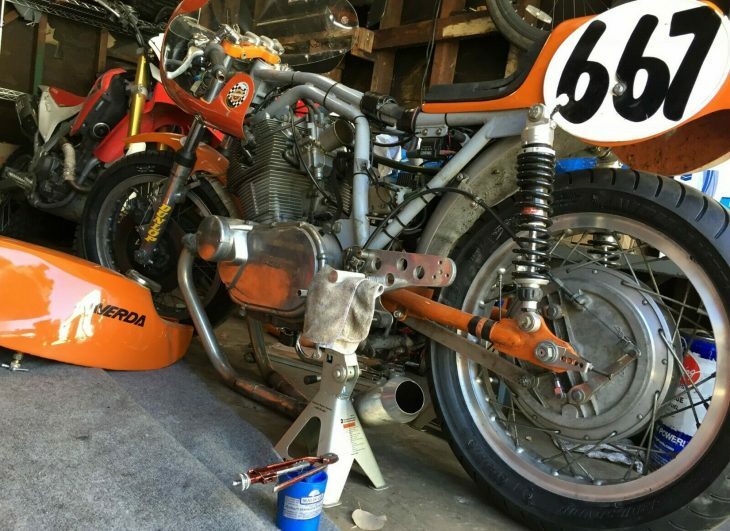 We've had our resident two-stroke tech go through the bike after a short storage. 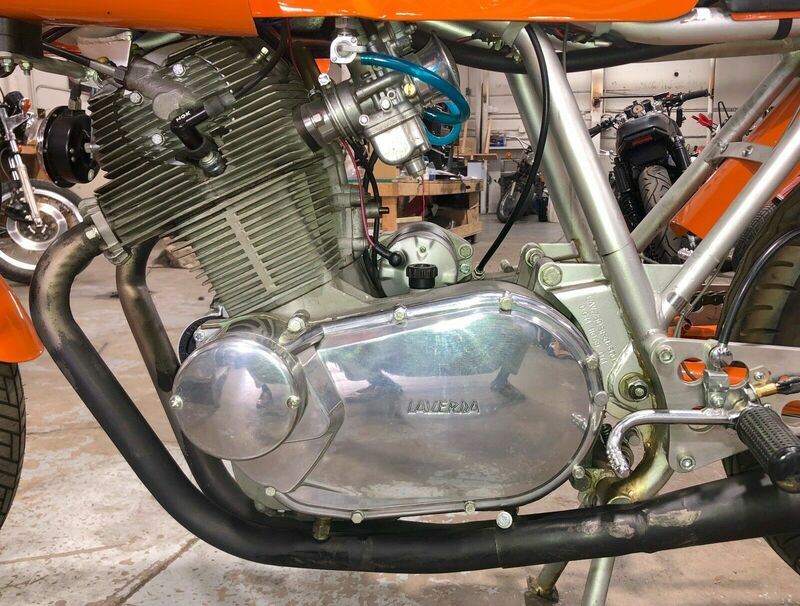 Air cleaner was replaced, tank drained, carbs removed and thoroughly cleaned, etc. Plugs replaced, fresh trans oil. Bike started easily and runs well with no clutch slippage. Left fork seal has slight seep and as any two stroke, it could take more fussing to get carburation perfect. Trans shifts very well but clutch pull a bit heavy (upgraded springs?). Brakes solid and chatter free. This is a well sorted RZ. YZF750 complete USD front end and brakes. Alex Mayes chambers - Rare! There is NO reserve or buy-it-now price on this item. Other RZ brochures and some parts are available but are not included with this bike. Pick up at our dealership in Pennsylvania (19512) has no charge of course, but delivery by truck or international shipping is the responsibility of the buyer. 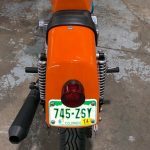 As the seller describes it, "this is a well sorted RZ," a daily rider that captures the feel of an earlier era of performance, with a couple modern touches. Unfortunately, there are no takers yet at the $13,000 starting bid, with just a few hours left on the auction. Is it too early in the season? Were the modifications just a bridge too far? 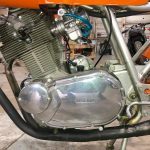 Has the interest in two-strokes plateaued? 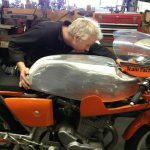 When the original "jellymould" CBR600F Hurricane was introduced in 1987 the enclosed, sleekly aerodynamic fairing hid a dark secret: a steel frame. 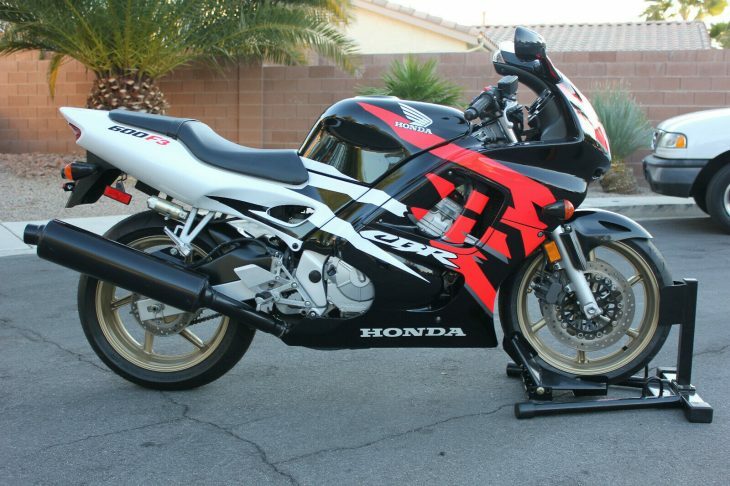 While racier competitors had switched to lightweight aluminum construction, the simple, effective CBR600 F3 stuck with the less expensive material until the CBR600 F4 was introduced in 1999. Although the styling was hyper-modern, it also helped Honda save money on manufacturing and development costs. 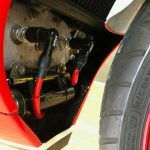 Instead of a finished frame and engine cases, or carefully routed wiring and hoses, the whole functional mess could all just be hidden behind relatively cheap, sleek plastic. So while pragmatism may have driven the design and the ingredients were, on their own, not very exotic, the complete package was a world-beater when it was introduced. 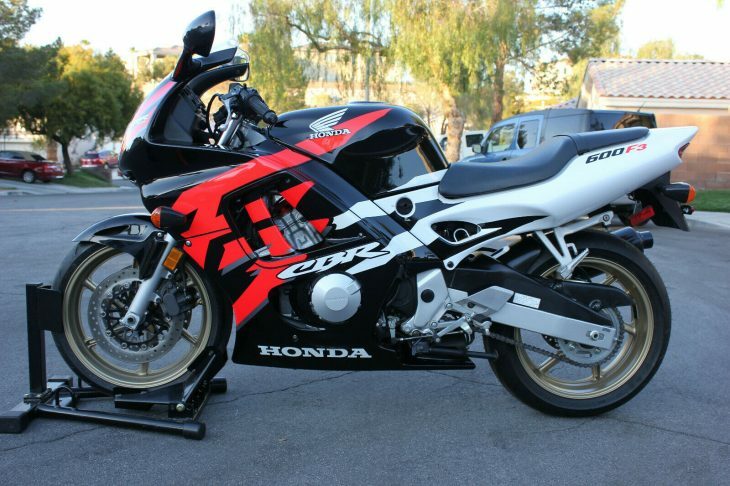 Produced between 1995 and 1998, the F3 was an evolution of the earlier CBR600 F2. Compared to that bike, it offered adjustable cartridge forks, a Pro-Link rear, and and ram-air to feed the engine. 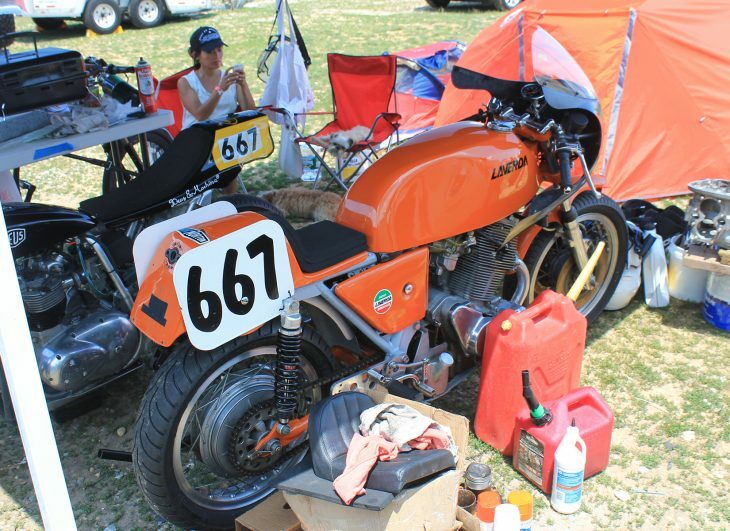 The result was a few more ponies from the 599cc inline four and a 454lb wet weight. 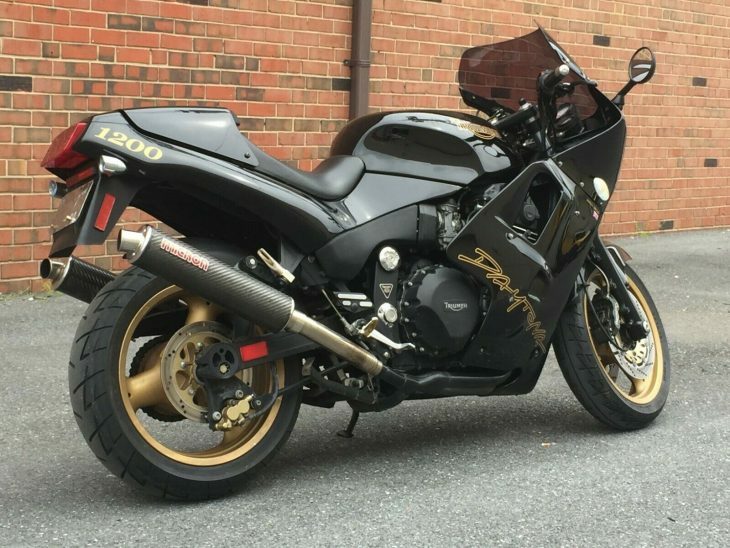 That might sound heavy for a 600, but it was just a couple pounds heavier than a ZX-6R or GSX-R600 of the same period, and actually a good bit lighter than the aluminum-framed YZF600. At a claimed 105hp, peak power wasn't best-in-class either, but the CBR offered a smooth spread of power with no real dips or flat spots, the perfect balance in a road engine and pretty handy on track as well. 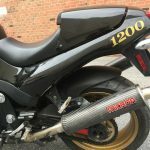 The CBR600 was always pitched as a more versatile mount than competitors from Suzuki and Kawasaki, a bike that was at home in the canyons, in the city, and could even do a bit of commuting or light touring. The CBR600 was never really about the numbers, it was about the complete package, a sort of Goldilocks solution to the Supersport problem. It didn't make the most in-class horsepower. It wasn't the lightest. It didn't have much in the way of headline-stealing innovation. It didn't even have any acronyms plastered across the fairings! 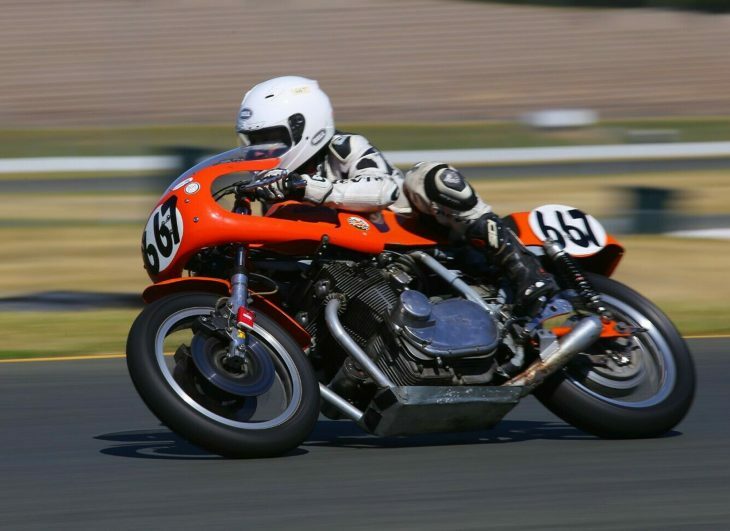 It also made a perfectly good foundation for a racebike, winning multiple AMA SuperSport Championships, and didn't seem to suffer at all for its relatively ordinary underpinnings. 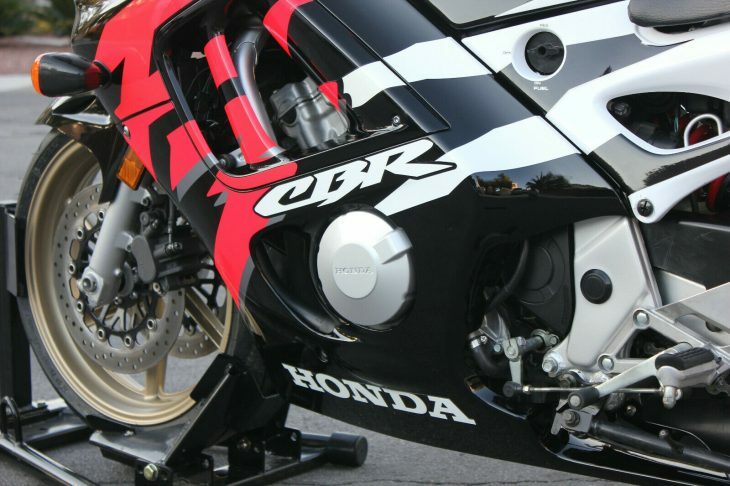 Eventually, the entire class became more and more track focused, and led to the development of the CBR600RR that was sold alongside the CBR600 F4i as a direct alternative to the high-strung offerings from Suzuki, Kawasaki, and Yamaha. 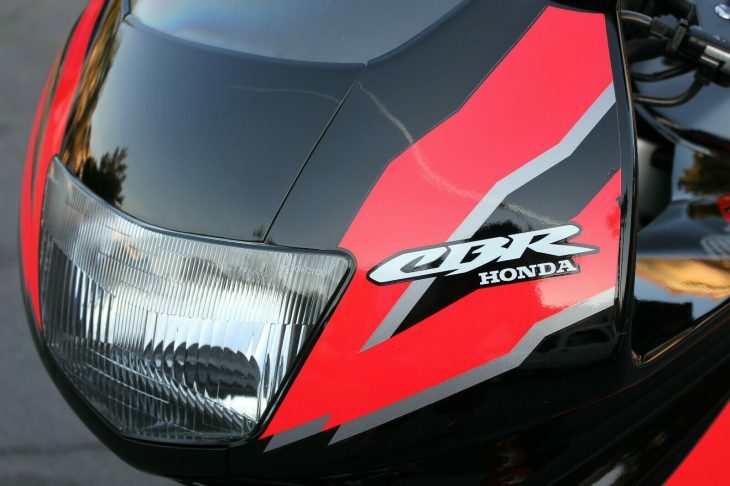 But for a while, Honda's versatile CBR meant you really could have your cake and eat it too. 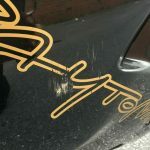 This particular machine needs a bit of maintenance before it time-warps you back to your youth, but the miles are shockingly low for such a practical machine, and it looks to be in exceptional cosmetic condition. 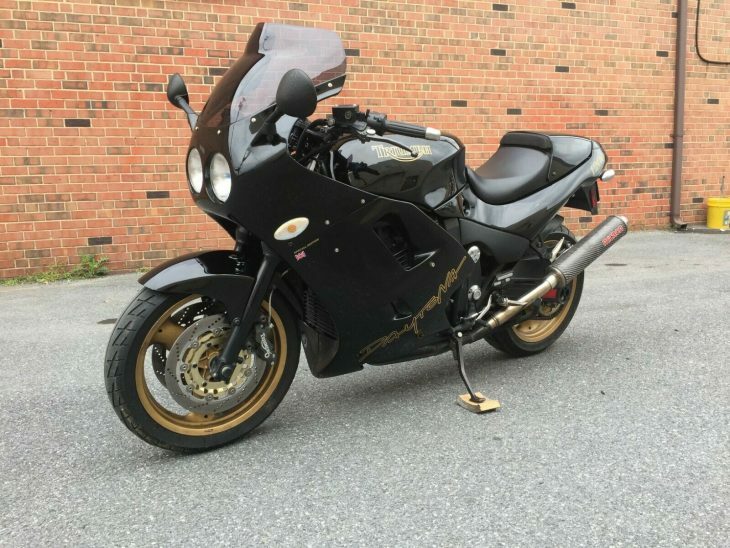 It may never be as desirable as a CBR900, but I these are certainly functional classics and much more attainable, since prices for the bigger machine are currently spiraling upwards and nice examples are hard to find. 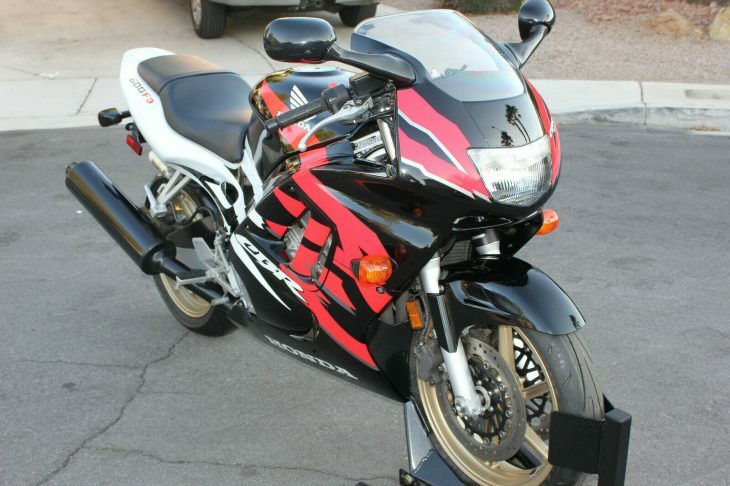 Hello, up for sale is my 1997 Honda CBR600F3 with 2,916 orig miles. Clean title in hand in my name. Bought it 4 years ago and spent lots of time and money trying to make it near perfect (it's the same model, year and color as what I had in college so it was me trying to relive my youth). Sadly, my bad back in combination with it being too dangerous for a slow, fat guy like myself to ride in Vegas forces the sale. I have all receipts and replaced parts baggies/boxes for every OEM part I put on it. I saved the old parts to prove it wasn't wrecked. Feel free to contact me to see it in person 850-five 86-38two8. Not showroom perfect but damn nice for a 1997! PS: front chock included! The bad: carbs need to be cleaned. Ran fine in 2014 and I did drain bowls before tear down but no luck in getting it started. Needs battery too as no point in buying one and letting it rot. The good: over $1,000 in brand new parts. 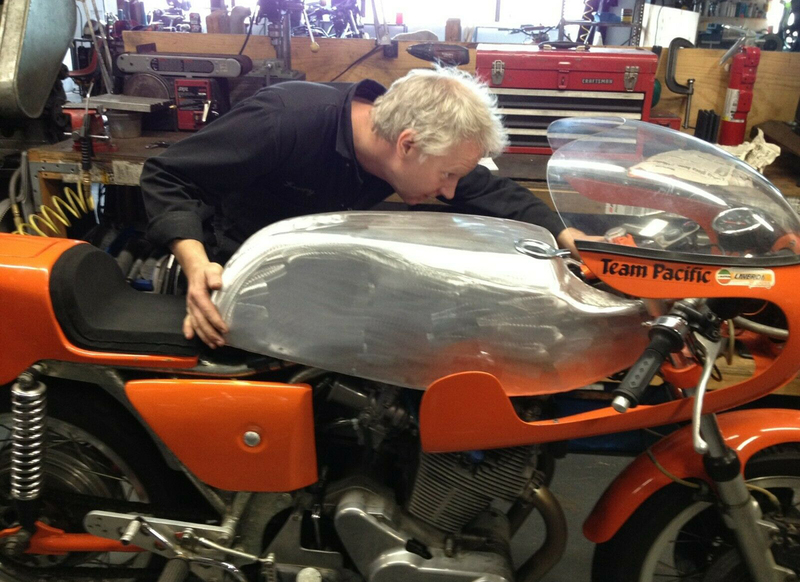 No cracked fairings at all! 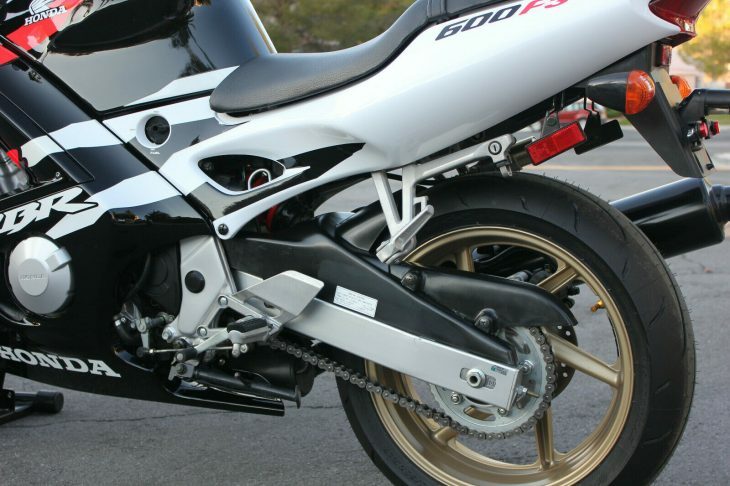 The CBR600 may have been anything but exotic, but that was exactly the point: it was an everyman sportbike, and it was damn good at being that. The shape has aged pretty well I think, and the non-standard gold-painted wheels really flatter the Erion Racing-inspired colors. It's a shame that this attempt to capture the seller's youth has been put up for sale, but his loss is your gain! Can you really put a price on reliving the dreams of your youth? Apparently you can, and those dreams are going to cost you $3,950.00. That Buy It Now price is obviously on the high-end for an F3, but if this one is as nice in person as it looks in pictures, I think you'd be hard-pressed to find a better example with so few miles.